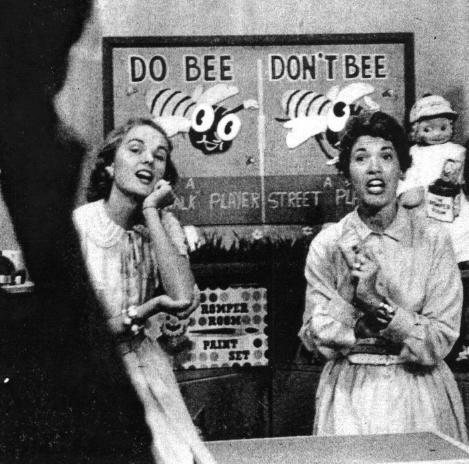 creator Nancy Claster, singing the "Do Bee" song to other prospective teachers in 1956. 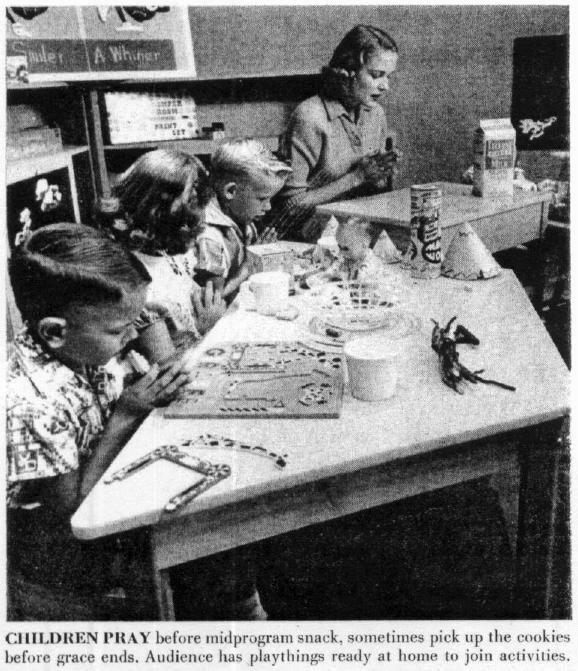 The following brief article with photos is from Life Magazine (September 24, 1956), courtesy of Marlyn Johnson, "Miss Lynn" in Winston-Salem, NC 1956-1957; read her note at the bottom of this page. As an example of TV preschool programs, Romper Room is a cut above the average. It is spry, bright and instructive. As an example of TV production, it is a notable departure from the routine. The program is shown on weekdays usually at 9 a.m. on 43 U.S. stations. But instead of filming the program and sending it out in reels, Romper Room's producers ship out scrubbed and shining college girls trained to run it as a "live" show. 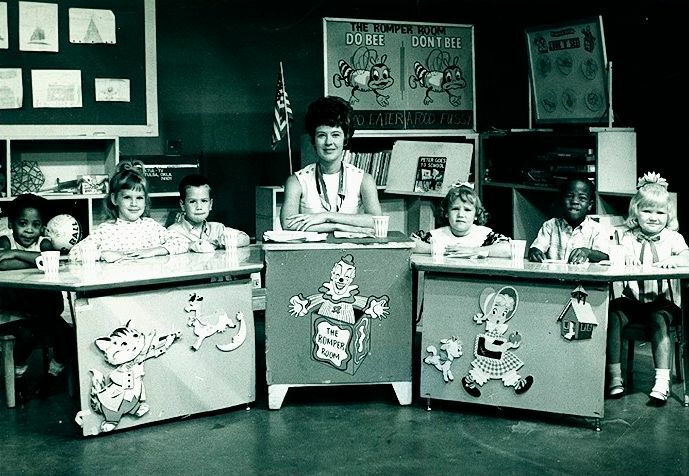 At WBAL-TV in Baltimore where it all started in 1953, Romper Room "teachers" are taught the tricks of the show's trade. They master toys, songs and games, learn how to recite commercials and cope with classroom calamities. 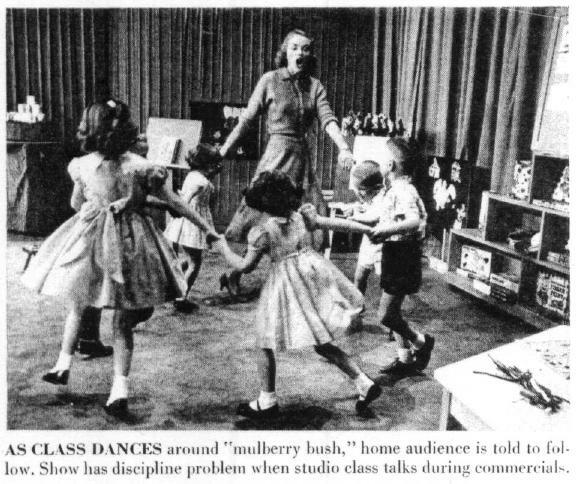 When new teacher Mary Susan Gifford took over on station KTVX (which became KTUL...webmaster) in Tulsa, Okla., she suggested to her studio class that they go for a hobbyhorse ride, whereupon the children rode right out of the studio. Teacher managed quite nicely in the crisis. She told the home audience that the studio horsemen were just hiding. "Romper Room was a pre-schooler that ran in almost every major market in the United States and ran from 1954 until the late Seventies...All of the hosts, many former kindergarten teachers, spent the half hour reading from books to the seven or eight kids on the set, teaching the alphabet, manners and values in a gentle way...Each show ended with the hostess gazing into the 'Magic Mirror' (just a mirror frame) and saying (changing the names each day): 'I see Mary and Hank and William and Virginia and Hannah and all of you boys and girls out there!'" Does anyone remember the show Romper Room? I was on there when I was about 4. Of course I don't remember a lot about it...have a picture though..do remember the mirror she used and the Do Bee and Don't Bee. Really enjoy your site...brings back some good memories of Tulsa. (Our local Romper Room teacher) went by the name of "Miss Lynn." I'm pretty sure that was her first name, but I don't remember what her last name was. (She probably hosted after the tenure of "Miss Nancy", and would have been distinct from Marlyn "Miss Lynn" Johnson of North Carolina, whose note appears at the bottom of this page...webmaster). My brother was on the show for a whole week. When I was growing up, our next-door neighbor was Saidie Adwon, who later became GM of KTUL. At the time, "Romper Room" was kind of slow taking off, and Saidie was quite anxious to find kids who would appear on the show. So my little bro' got the duty. 7/24/2010: Courtesy of Rich B: Miss Lynn on KTUL-TV. Any guesses on the year? I would say around 1968 by the hairdo. Someone asked for memories of Romper Room. 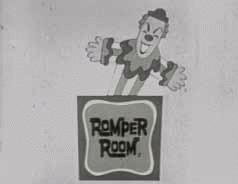 I worked on the floor crew at KTUL-TV when Romper Room first started on the station in early 1957. The first Romper Room teacher/host was very nearsighted but wouldn't wear glasses on camera. In one segment she was showing pictures the children had drawn and making comments about them. She had thumb tacked them to a cork board. On one picture she pointed out what a nice sun the child had drawn. The director cut to a close-up and it was a yellow thumbtack that she had used to put up the picture. We had huge cue cards we would use so she could see them from a distance. Contact lenses were not so common in those days but they would have dramatically helped her performance. My wife Susan, a music teacher, met another music teacher this year who is of local TV interest. She is Miss Peggy, of 1960s Romper Room fame. She is still active as a substitute teacher in the Skiatook/Sperry area. Susan said she is one of the favorite teachers. I wonder if she still uses the Magic Mirror to check in on the kids at home? 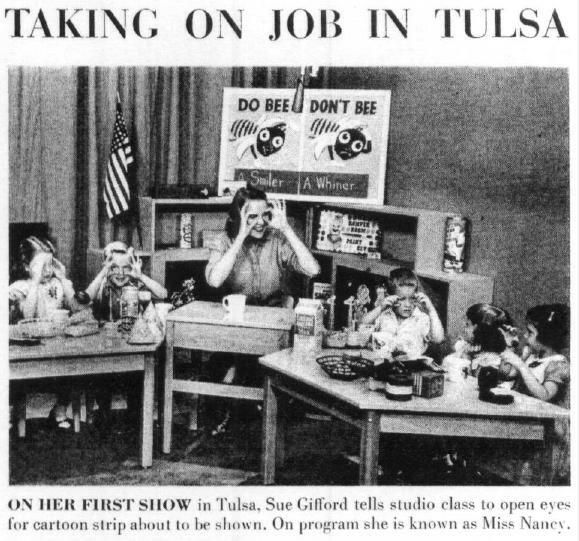 I read that you were part of the floor crew when Mary Susan Gifford ("Miss Nancy") was the first "Romper Room" teacher at KTUL in Tulsa. I assume you were there when Life Magazine photographers were there doing an article for a September 1956 issue with film star Janet Blair on the cover. Do you know if Sue is still living? I remember that her husband's name was Joe. He has already interviewed more than one hundred Romper Room teachers from the '50s. I met Sue when we were in Baltimore for our one week of training before becoming "television teachers". I had forgotten about her poor eyesight but I did remember that she ate dessert before her meals. The floor crew always held a special place in my heart because I depended them every day. My kids cannot believe that we had no color, no videotape, and no teleprompter and we had to use the darkest pancake makeup on our faces.